Anon-Co is offering a Tecsun PL-606 Clone for $31.99 shipped. It’s badged as a: “Ritmix RPR-7020”. I’ve never heard of that badging/brand, maybe you have? Kaito (via Amazon) currently prices the PL-606 at $41.80, Amazon’s price is $46.50. Click here to view special on Anon-Co’s website. Thank you for the tip, Troy! That is a great price for the PL-606 and Anon-Co is a retailer I certainly trust. I’ve never heard of the Ritmix name either. This entry was posted in Deals, News, Radios, Shortwave Radio and tagged Anon-Co, Ritmix RPR-7020, RPR-7020, Tecsun PL-606, Troy Riedel on July 9, 2017 by Thomas. Tecsun PL-606: Tapping into the IF? I just wondered if you have ever seen any information about how to tap the I.F of the Tecsun 606 by any chance? I want yo use it for DRM but cannot find any info . I have not seen info on tapping into the IF of any of the recent Tecsun portables. Can someone help Lee? I would be very curious how to do this myself. This entry was posted in How To, News, Radio Modifications and tagged IF, PL-606, Tecsun, Tecsun PL-606 on February 21, 2016 by Thomas. Wow–indeed, I’m glad you checked as well! I had searched the PL-606 owner’s manual (PDF), but found no reference for voltage tolerances. Now I’m curious if other Tecsun receivers would have difficulty handling the higher lithium voltage. Please comment if you have insight! This entry was posted in News, Portable Radio, Shortwave Radio and tagged Lithium, Lithium Batteries, PL-606, Tecsun, Tecsun PL-606 on August 24, 2015 by Thomas. 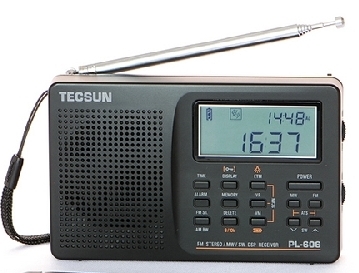 Good news: Universal Radio is now offering Tecsun radios for the US market. So far, they have the PL-360, PL-606 and PL-660 listed among their offerings. Check out the direct links above or look at their full selection of portable radios by clicking here. This entry was posted in Radios, Retailers and tagged Tecsun PL-360, Tecsun PL-606, Tecsun PL-660, Universal Radio on December 15, 2011 by Thomas.